We never actually planned to go to Macworld until I received an e-mail from IDG, who organize the Macworld Expo, inviting us to sign up as exhibitors in the Indie Software Spotlight section. We have just earned some extra cash from ImageFramer 3 upgrade. So I wanted to play with the idea and forwarded the e-mail to Kosta. And suddenly we decided “Why not”? So what were we thinking? We started to recognize that our main difficulty has now become not the development of the applications but rather the ability to sell them, i.e. marketing. And an important part of being successful in marketing is getting to know key media people personally. We had hard time getting into major press outlets, especially in the US. So our main goal was to meet the press. The secondary goal was to meet other successful Mac developers, whom we only knew through Twitter or e-mail. The third was to present at the Expo and to just have fun. 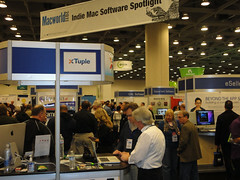 For indie developers Macworld offers a kind of an all-in-one package, which includes a small kiosk in the Indie Software Spotlight area of the show floor. This kiosk has one wired Internet access, electricity, standard signage with your company name and a little storage space. So, ideally, you only have to bring your computer and you’re set. In reality, it requires more preparations. So what does one need to prepare for the Expo? You need to prepare a computer which you’ll use in the booth. You need to prepare demos for each of your applications and train to present them. I created a separate user account for the Expo, installed applications on it and all the files needed for the demos. Then you have to prepare a second computer with the same files. This is good both for backup and for times when you might need to present at two different locations at the same time. The kiosk has little options for customization. You can put one large poster on the back wall and also stick smaller ones on its sides (which we only learned about in San Francisco). It’s also a good idea to prepare flyers describing you software and your company. We heard several estimates about the amount of flyers that should be enough for the Expo. Most indie sources concluded that 1000 should be enough. But because we were overly optimistic and the price difference was small we printed more of them. In retrospect we shouldn’t have, as we left most of them right there in the kiosk after the end of the Expo. Macworld also offers additional ways to help you promote yourself. Some are free but most cost money. We took advantage of all the free options available to us. These included participating in the First Looks program, Speaker Bag program and a press conference. For the First Looks program you can submit a product that was released up to six months before the event. It will then be included in a press release that IDG issues a couple of weeks before the Expo. During the Expo itself there is also a large display of the products participating in the First Looks program near the registration area. For the Speaker Bag program you can submit something to be included in the bag that the conference speakers receive before the conference. It’s a good way to let your products be known by influential people in the industry. So we designed a special CD with our applications and a way to receive NFR licenses for them. We had then duplicated 125 of these CDs and have them shipped to IDG, all remotely in the US, without even seeing the CDs with our own eyes. As I wrote earlier, one of our goals was to meet other indie developers. So several weeks before the Expo, Kosta has contacted some local developers that we knew to organize a meetup. Our flight to and from San Francisco had a connection in Amsterdam. On the way back we had about seven hours during daytime to spend there. I contacted Dirk from Sofa, the successful indie company from Amsterdam, and we agreed to meet at their offices on our way back. Last thing, a couple weeks before the Expo we were contacted by a Bay area PR guy, Daryl Wise, who offered his services for the duration of the Expo. In retrospect, much of his help was related to logistics. Since we were coming from far away and had little time in San Francisco before the Expo it was really helpful to have someone local handle stuff that’s hard to do remotely. For example, he helped with the CDs for the media, the video equipment for the press conference, last-minute printing of the posters, providing a screen for the booth which saved a lot of money and hassle and other helpful stuff like that. We arrived to San Francisco on Saturday. The Expo starts on Thursday and the booth has to be set up a day earlier. So we had several days to prepare and to tour the city. Unfortunately we left too much preparations for San Francisco, like preparing the demos and practicing them, so we had little time to tour. Daryl took us to the Twin Peaks, to the Golden Gate Bridge and to an area near the Golden Gate Park. Unfortunately we didn’t have time left for the park itself. 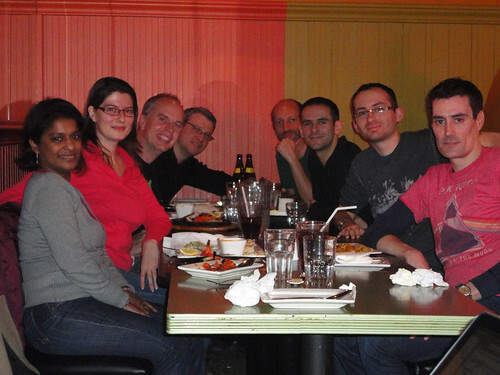 On Tuesday evening we held the indie meetup in an Indian restaurant not far from the Moscone. We met with Dan Wood from Karelia software, Jean MacDonald from Smile software, John Fox, the developer of Memory Miner, Michael Simmons of Flexibits, Steve Gehrman of Cocoatech (Path Finder), Jonathan Freeman of Widget Press, Sandrine Loiseau from Creaceed and her friend Isabella who helped her at the booth. We organized this meetup in order to discuss the business side of the Mac software development and it was a time well spent. It is really much nicer and beneficial to have the opportunity to talk face-to-face, in a group, and not on Twitter or on a mailing list. It also helped us to get into the mood before the Expo started. On our way to the meetup we jumped into Moscone, got our badges and saw the preparations at the registration area. They were also constructing the first looks display and we were glad to see our name and flyer there. 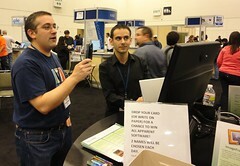 On Wednesday morning Daryl picked us up from the hotel and we went to Moscone West to set up our kiosk. It wouldn’t have taken so much time had we been more prepared. But we had to jump to a nearby Office Depot to buy some missing stuff and a couple of markers. The text on our hastily prepared posters for the sides of the kiosk was barely visible because of low contrast so Kosta and I drew over the letters with the markers. For Wednesday evening we were invited to a party that Smile Software organized. Held in a nice nightclub, it was our first real opportunity to meet the press. We’ve met Chris Foresman of Ars Technica who previously interviewed me twice about our MacGraPhoto bundle. It was a nice surprise since he told me he was not supposed to be at Macworld. We met several representatives of TUAW, the Mac Observer, Cult of Mac and probably a couple more. We’ve also had an interesting conversation with Oliver Breidenbach of Boinx software, one of the largest and more successful Mac indie companies and shared experience with Philip from Smile. So even before the Expo itself actually started, we’ve already got a taste of networking opportunities that are available during Macworld. The next morning, around 9 AM, we were already on our spot in the Indie Spotlight area, making last preparations and set ups. The doors opened at 10 and a large wave of people started to fill the hall, flowing from all directions. At the beginning of the Expo most people seem to be aimlessly wandering the floors, trying to get an idea of who’s presenting what. The exception to this rule were the occasional goal-oriented guests, whose only aim was to fill their bags with all the free stuff that was there in the booths. They didn’t seem to care about the actual content of the Expo. 1. People who’ll never be at your booth. IDG says there were about 25,000 people at Macworld this year. Somehow I doubt it very much that I’ve seen so much people pass by our kiosk. Although Macworld was smaller this year than in previous years, still it’s a large hall. And if a visitor spends some time here and some time there he might just not have the time left to visit all the presenters. Also, not every one cares about software, especially for the Mac. Yes, we actually had to ask people who come to Macworld if they own a Mac! Many didn’t own a Mac, rather only having an iOS device or maybe no Apple product at all. 2. People who’ll walk by your kiosk, throw a fast glance and continue. If we don’t take the unmeasurable first group into account, this is the largest group of all. They are most probably not your potential client, or they’d show some interest. The best you can do is to give them your flyer. It probably won’t convert but on the other hand, you don’t want to carry any flyers back after the expo and have probably brought too many in the first place, anyway. 3. People who’ll stop to read your poster or flyer. We had our flyers on display as well, on the sides of the kiosk tabletop. Some people stop to read them or the big poster to learn more about your offer. This is a good opportunity to ask them if something interests them and if they’d like to see a live demo. Some of them are just too shy or unsure to ask. Even if they say no to a demo, they’ll probably take a flyer, so give one in their hands before they leave. 4. Some people will find interest in your applications and will ask for a demo. This is as close to a potential customer as you can get. The questions that people ask during the demos will also serve as a guideline to see what people understand from looking at your software and what they want it to do. During the demos we’ve had lots of positive feedback, questions and feature requests. Sometimes several people want to know more about your software at the same time. So it’s good there were the two of us at the booth most of the time. While one was giving the demo at the Mac, the other was engaging the other people. If we saw that the ongoing demo will take some time, we’d sometimes describe the application on the screenshots from the flyers first and then get to the demo, if needed, after the previous one ends. There’s really no room for 2 large Mac displays on the kiosk, although we occasionally used the second Macbook Pro for the demos on its 15″ screen. Remember to give people your flyer after the demo and explain where they could buy the application. Notify if you have any special discount for the show visitors, which is a good idea to have. We offered a 20% discount and some other developers offered the same rate, from what we’ve seen. 5. Current customers. These are the most rewarding. Somebody will pass by and just say, “Oh, I use ImageFramer and it’s great”. It’s really a pleasure to see your customers, especially if they say nice things about your products. It’s a good idea to ask these existing customers how they use your software. Some of them asked to show them our other applications. I even had a couple of tech support issues handled for existing customers, right on the spot. 6. Journalists. Media is also going around the expo floor to find interesting stuff to report, take interviews and record product demos. They will often come unexpectedly and point a microphone at your face. Be prepared for that as well. After all, that’s what you came for. Presenting your software 8 hours a day is not easy. The fact that the organizers didn’t allow putting a chair near the kiosk where we could sit and rest our feet and backs was very unpleasant. Official explanation is fire safety. But come on! It was much less dense in our area than in the regular rows of larger booths. In order to get some rest, lunch and other basic necessities, you have to leave the kiosk. That’s why being at least 2 people is almost a requirement. Although some brave and strong individuals succeeded to make it alone, I suppose they’d prefer to have someone there helping them anyway. Standing on your feet 8 hours a day for 3 days is simply hard. There’s also the additional benefit of being able to handle more people at the same time. Make sure to prepare some water and lozenges for your throat. We bought a pack of bottled water and put them in the storage area. Both proved to be useful. Cirque du Mac is an invite-only party with some great live music, courtesy of the Macworld All-Star band. It’s also filled with prominent people in the Mac ecosphere, members of the press and developers. We didn’t actually think of going there up to about 15 minutes before Expo day was over, when Sandrine from Creaceed who was in a kiosk next to ours reminded us about it. The tickets are distributed by sponsors of the event and we found tickets fast, courtesy of Jean from Smile. Guys from eSellerate who also were in a neighboring kiosk, offered tickets as well. 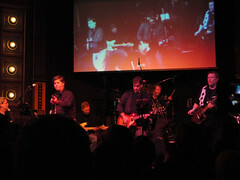 The party was great on all accounts – networking, drinks and Rock’n’Roll. We had some interviews and presentations of our application to the press right there in the kiosk. I also made a live video demonstration of Socialite on the live broadcast of TUAW. Some of these meetings were kind of prearranged. For example, Macworld’s UK editor’s visit was planned about a month in advance. We didn’t know she’ll make a kind of interview out of this meeting and will also watch demonstration of all the applications but we certainly didn’t object. The Socialite demo on TUAW’s live broadcast on the 3rd day was arranged during the Expo itself on the first day. Some other interviews, on the other hand, were either totally unexpected, where the journalist would approach us and ask to do an audio or video interview. These are the journalists and podcasters who go around the show and see what interests them and their readers. Frankly, the first couple of times I felt myself unprepared and probably wasn’t at my best. On these interviews the journalist will often only want to talk about one of the applications that you have (in case you have multiple, like we did). That’s ok. For example, some applications are better explained with visual demos so podcasters might want to skip them for that reason. With all the work by the kiosk, we had little time to actually be visitors at the Expo. For the whole 3 days we only made about an hour or so for ourselves to tour the place. 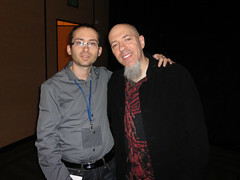 I only had one planned event that I wanted to attend and that was a featured presentation of Jordan Rudess about music applications for iPad. Just before the presentation, which took place in a large auditorium on the second floor of Moscone West, I met with Dan Engel, CEO of FastSpring, whose payment processing services we gladly use for our online store. Unfortunately, because of the presentation, I couldn’t give him the full attention that he deserved. Still, we shared some news and experience and I learned that much of what we see happening with applications sales, following Mac App Store launched, is common among other developers. But that’s for another blog post. I love progressive rock and related music, play guitar and had a band up to about 10 years ago and the Expo had a lot to offer to musicians. Jordan Rudess of the successful Dream Theater is one the best keyboard players in the world of rock and metal and Dream Theater is one of my favorite bands, so I was excited to go and see him in person, up close. In addition, Jordan developed a unique musical instrument application for the iPad and later he was presenting it at the show. 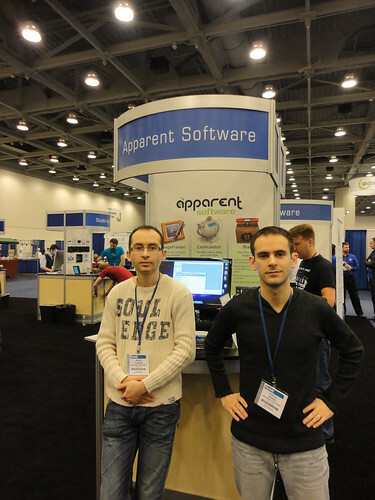 He and his company, Wizdom Music, had a spot in the Mobile App Showcase part of the Expo. It was very strange to see him the next day standing there like we did and demoing his application to other visitors. Well, just because I’m such a groupie, I’ll tell that after the presentation I got an autograph on my badge and a nice photograph together with him. This has nothing to do with the goal of this article but I can connect it by saying that it’s the kind of surprises that can happen on the Expo. Hey, if you like Sinbad, the comedian, he was also there. Back to the Expo. Well, the sad-but-true joke around was that the expo was all about iPad and iPhone cases. And that’s almost correct. A large part of the Expo floor was filled with booths presenting accessories for your favorite iDevice. iPhone covers, iPad stands, speakers, microphones and such. In fact, music was a large part of the Expo, with a music stage with live demos, lots of software, hardware and little things to connect your mic, keyboard or guitar to iOS device. Hey, I even bought one for my guitar. Still, the show was interesting to me, lots of innovation that I wasn’t aware of and surprised me to the better. I couldn’t see it all in the free hour that I had and so I probably missed many of the other interesting offers. At the end of the second day of the Expo, we went to have some beer with Krystian Kozerawski, a prominent Polish Mac blogger, among his other occupations. We had really became friends with him during these several days and he’s an intriguing person. After the beers we went to a party sponsored by HP but probably organized by TUAW. We wouldn’t have known about it at all if not for Krystian’s invitation to join him. It was another one of these opportunities to meet press, developers and other people from the Apple eco-sphere. Again, totally unplanned, we had a very enjoyable evening in a good company. After the third day was over, we had still one more thing that we wanted to do in San Francisco. Eat some crabs. Originally we only set up to go with Krystian but, luckily, by the end of the day, Jonathan Freeman of Widget Press and Sandrine with Isabelle from Creaceed joined our little company. 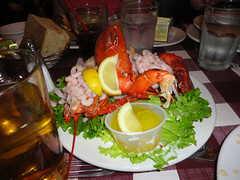 We all met at the Fisherman’s Wharf and had a nice dinner in a friendly atmosphere. Jonathan educated the unexperienced (I never ate crabs or lobsters in my life) how to handle them and it was a lot of fun. Great finale to an awesome week. Our flight back home was through Amsterdam, as I wrote earlier, and Sofa was on our minds. After a long flight we landed in the chilly Amsterdam. Luckily there was no rain. 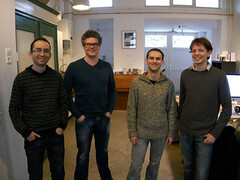 After an unsuccessful train ride, we took a taxi to Sofa’s offices and were met by Dirk, Jasper and other guys. Having only seen their double-studio office space on photos posted on their blog, it was kind of an achievement to see it in real-life. Dirk showed us around the place, introduced us to his team, and then we went on to discuss stuff that interested us and them – development, customer support, tools, version control systems and other geeky stuff. 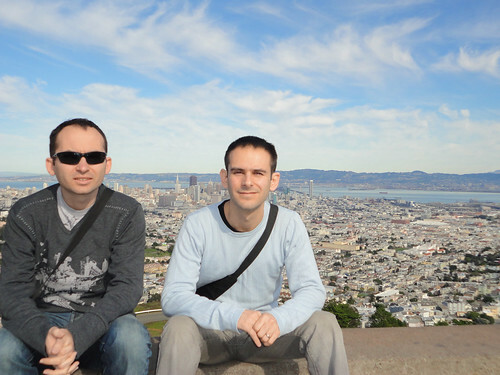 Kosta and I really enjoyed our visit there and you can see it on our smiling faces. For Kosta, meeting Sofa guys was kind of closing a loop. When he joined Apparent Software, to introduce him into the Mac indie software scene in a fast manner, I had him read “Indie Fever” report by Michiel van Meeteren, which was sponsored by Sofa and published on their site. First of all, I’m very glad that we went to Macworld. We believe to have achieved our goals of meeting the press and fellow developers, which we set to ourselves. We also had a lot of fun touring the city and going to the parties around the Expo. It was also a nice change from the everyday activities – Mail and Twitter were substituted for real, face to face, social interactions. As they say, it was nice to put a face to the twitter account, or something like that. Meeting existing customers and hearing their feedback was a nice boost to our morale. Does this mean that we’ll do it next year? I’m not sure. This is quite an expensive event (see financials below). In addition, we’ll need something new to present. And at the fast pace that things are changing here, I have little idea how things will look like by the same time next year. A year ago we only had ImageFramer 2 and Cashculator. 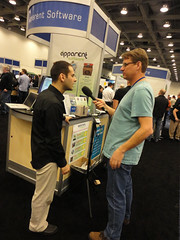 We went to Macworld to promote ImageFramer 3, which was released in October. We also acquired and developed Blast during 2010 and less than a month before the Expo we acquired Socialite from Realmac Software and so, in a rush, we made it a central part of our offering at the Expo. If you’re a developer thinking of presenting at some future Macworld, make sure you define your goals well and in advance. Then plan on how to achieve them during your time there. For example, we had prepared a short list of people whom we wanted to meet. We organized a developer’s meet-up. And we had our elevator’s pitches ready. Macworld is not cheap for a small indie group as we are. A year ago we wouldn’t even have dreamed of doing it because our financial situation was far more constrained. 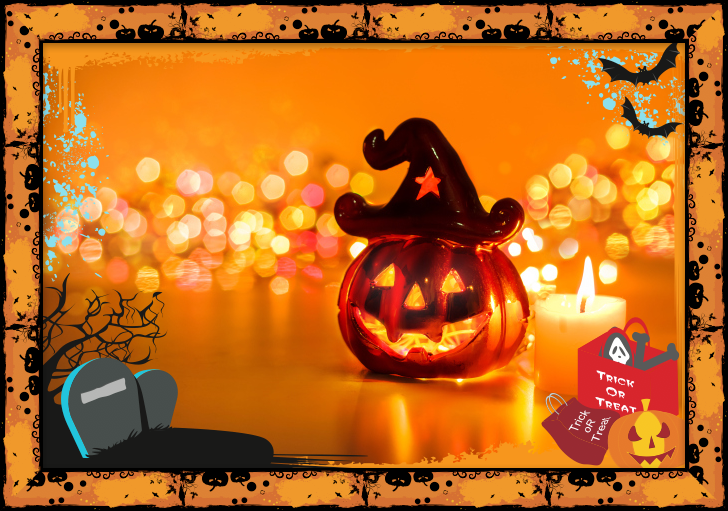 Even this time, it was a considerable expense and we tried to be as frugal as we could. The Indie Software spotlight area offered two kiosk sizes. The small one cost $3995 (or $3795 for early registration) and the double-sized one cost $6295 (early price of $5795). We went for the smaller one. The second expense was plane tickets and hotel. The plane tickets cost us a bit over $1000 each. Of course, we had quite a long trip so your mileage may vary. We stayed 8 nights in San Francisco. We looked for an hotel under $100 per night, so all the nearby hotels that were offered by IDG were too expensive for us. We were ready to go by foot from the hotel for 15-20 minutes, if need be. In the end we chose Hotel Carlton on Sutter street. It was a little bit farther than we would’ve liked but we couldn’t find anything with good reviews and in the price range in the Union Square area. In the end, we went several times by foot but during the Expo days we took a taxi, to save our feet, which were working extra hours anyway. The taxi usually cost about $9 dollars each way. But we had bad experience with catching taxis in San Francisco and often had to wait for quite a long time to catch one. Promotional material. We had prepared a lot of flyers, which later appeared to be too much. We also had some separate flyers for ImageFramer and additional separate, business-card sized ones, for Socialite. Cost of designing flyers and printing them can vary a lot based on your needs and amounts. It cost us about $800 total and this was quite cheap for what we got. We just brought too many. CDs for the Speaker bag program cost us $249, including shipping. We used Disc Makers for the CD duplication. PR services. We were contacted by a couple of PR agencies before the show. Large PR firms usually offer their services for $6000/month. I could get one down to $5000/month. They wanted at least two months to work for Macworld. It’s way too much money for us and we weren’t even sure if we could get any benefit from these large, non-Mac oriented agencies. After all, we don’t need articles about us in Fortune magazine or in Inc. I wrote earlier that we had help from Daryl Wise during Macworld. I can’t say exact numbers but it was much cheaper. We also worked with him on hourly basis which gave us control over our expenses. We had a press conference. While the room comes with audio equipment, there’s no video one. We paid about $200 to rent projector and screen from a non-profit. The same from official supplier for the Expo would have cost twice as much. Additional expenses are not related to business so much. There’s the food, touring, souvenirs and gifts expenses. But these can be considered personal. The bottom line, unless you live in San Francisco, is that you’ll need at least around $6000 dollars for one or two persons coming to Macworld. I hope you enjoyed my ramblings. If you’re a developer considering presenting at Macworld for the first time, I hope you’ve found some helpful information in this post. If not, I’d like to know why you read this lengthy post in the first place :). If you’d like to get in touch with me, have some more questions or you’re just so friendly, you’re always free to contact us on twitter or through our support system. You can see more photographs from our trip on our Facebook page or on Flickr.